In business for over 30 years, Gainesville Ironworks’ focus is on the high quality of the custom products and services we offer. Our design, fabrication, and finishing professionals have over 70 years of collective experience. From our 7,700 square foot facility in Gainesville, we service our customers directly in north central Florida, across the United States, and internationally. Our innovative design professionals and talented craftsmen will work with you to develop the custom work that fits your project, schedule and budget. Craftsmanship and personal service are what puts Gainesville Ironworks a notch above the rest.We are an ornamental custom fabrication shop serving Northern Central Florida. We build custom projects using iron, aluminum, stainless steel, copper and brass. Our product line has grown to include beautiful railings and staircases, driveway gates and courtyard gates, fencing. 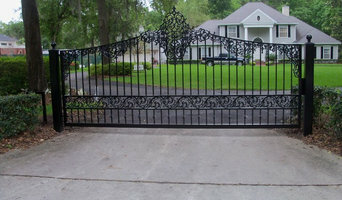 Gainesville Ironworks creates custom driveway gates and fences in aluminum with the look of wrought iron. We customize automated entry systems and gate operators, for residential communities and private homes, and have experienced technicians to maintain your entry system. You may not realise it, but the fine detail in balustrades, gates and garden screens is often the work of wrought iron specialists. Also known as blacksmiths, they can cut, shape, join and solder metals into forms that are as decorative as they are functional, for Lake Butler, FL home projects large and small. Whether your taste is classic or contemporary, a blacksmith or wrought iron craftsman can design and fabricate bulk metals to complete the style of your Lake Butler, FL home, then install them onsite. This includes ornamental sculptures, stair and balcony balustrades, fences, and gates. Some pieces are mass produced, while others can be custom crafted with intricate curves, spirals, decorative insets and symbols. To achieve your desired effect, they will use a range of processes including forging, bending and welding. Find a Lake Butler, FL blacksmith, welder or wrought iron worker on Houzz. Scroll through this page to find blacksmiths, welders and ironworkers in your area that can design and fabricate metal work for the interior or exterior of your home or landscape. You can browse their portfolio, read reviews and see how other homeowners rate their service and expertise.